Incredible claims of electroplating in materials synthesis lies in tailoring its property by proper modulation of the bath composition and operating parameters, such as current density (c.d. ), pH and temperature. Electroplating of metals/ alloys is one of the most complex process because of the unusually large number of critical elementary phenomena involved during deposition. Due to lack of quantitative guiding principles to develop a coating of desired property, it is very difficult and time consuming to optimize the bath composition. Even though Hull Cell method is an established method to optimize a bath, in terms of its constituents and operating parameters its application is limited to know only the effect of c.d. on deposit patterns; and is incapable for predicting the desired properties of the coating, like hardness, reflectivity, thickness etc. In this direction, this paper describes Taguchi’s statistical method for optimization of deposition conditions of Ni-P alloy, using Minitab 16, Statistical software, by reducing the number of experiments to a practical level. In the present study, bath variables, i.e., [glycerol], c.d. and pH of the bath are taken as chosen parameters and micro-hardness and thickness of the coatings as parameters for characteristic performance. Experimental conditions were optimized to maximize the coating properties. Taguchi’s method demonstrated that the basic Ni-P bath, having [glycerol] = 20 mL L-1, c.d.= 4.0 A dm-2 and pH = 8.0 as ideal for developing coatings of highest micro-hardness and thickness. Experimental data revealed that both [glycerol] and c.d. have close dependency on thickness and micro-hardness of coating, compared to pH of the solution. The experimental steps followed for applying Taguchi’s method, for tailoring the deposit characters are discussed with Tables and Figures. The electrodeposition of Ni-Co alloy coatings on pure copper has been carried out at different current densities (c.d.) from an aqueous sulphate bath at room temperature. The effects of c.d. on deposit characters such as composition, hardness and thickness have been studied. The electrodeposited Ni-Co coatings were tested for their electro-catalytic behaviors, namely for hydrogen evolution reaction (HER) and oxygen evolution reaction (OER) in 6M KOH by cyclic voltammetry and chrono-potentiometry techniques. The surface morphology and phase structure of the deposit corresponding to different c.d.s were studied using, respectively FEGSEM and XRD study. The chrono-potentiometry study revealed that Ni-Co alloy coating deposited at 4.0 Adm-2 is more electro active for HER and that deposited at 1.0 Adm-2 is more electro-active for OER. Hence, Ni-Co alloy coatings deposited at 4.0 Adm-2 and 1.0 Adm-2 can be used as efficient electrode materials for, respectively HER and OER reactions finds applications in fuel cells as demonstrated by cyclic voltammetry (CV) and chrono-potentiometry experiments. The characteristic electro catalytic behaviour of the coatings for HER and OER are attributed to the inherent phase structure, composition, specific surface area and porosity of the coated materials under test, determined by the cathode current density at which they are deposited, supported by FEGSEM and XRD study. Tin-cobalt alloys were electrodeposited onto nickel-plated brass substrates using a pyrophosphate electrolyte. Deposition conditions were as follows: current density, 0.2-0.3 A/dm2, bath temperature, 45±2°C, pH 8-8.2, ratio of Sn:Co 1.2:1 and current efficiency, approximately 90%. The bath exhibited good throwing power. Deposit morphology was uniform, with cauliflower-like microstructure, mean grain size 125nm. Visual appearance was very similar to electrodeposited chromium with a bluish-white colour. Electrochemical corrosion measurements using Tafel extrapolation and impedance data (as Nyquist plots) showed that Sn-Co alloy and decorative chromium had comparable corrosion resistance with values of 7.77*10-7 A/cm2 and 200 000 Ωcm2 respectively. The results demonstrate that electrodeposited tin-cobalt alloy can be a viable replacement for decorative electroplated chromium. Nickel plating was carried out in stable Nickel ion based deep eutectic solvent (DES). The DES electrolyte stability and possible structure were explained by using Fourier Transform Infrared spectroscopy (FTIR) and Temperature Modulated Differential Scanning Calorimetry (TMDSC) techniques. The conductivity and electrochemical studies for choline based eutectic solvents were analyzed by conductivity cell and electrochemical impedance spectroscopy respectively. Higher current efficiency, thickness and hardness of Nickel were obtained by Pulse current electrodeposition when compared with Direct current electrodeposition. Crystallographic orientation and structural morphology were studied by X-ray diffraction (XRD) and Atomic Force Microscopy (AFM) respectively. Coated Nickel plate’s corrosion resistance and porosity properties were checked using potentiodynamic polarization and electrochemical impedance spectroscopy. The electrodeposition of NiCo alloy has been investigated in presence of various magnetic fields. The influence of superimposed magnetic field (0-0.5T) parallel to the electrode surface on current efficiency, surface morphology, preferred crystal orientation and electrochemical activity of Ni-Co alloy were studied. The maximum current efficiency was obtained by direct current at 100mA/cm2 with 0.4T. The optimized current density (100mA/cm2) was pulsed at four different frequencies (10, 25, 50 and 100Hz) with the same magnetic field (0.4T). However, the superimposition of magnetic field significantly favors the preferred crystal orientation of (220) phase. 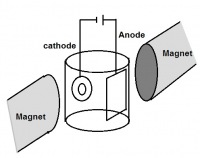 Pulsed current deposits exhibit single orientation of (220) at lower magnetic field (0.4T) whereas direct current deposition require higher magnetic field (0.5T). Tafel plot shows that electro-catalytic activity and corrosion resistance property has improved when the deposit is having a preferred orientation of (220).